In the night of August 27-28, 1944, 647 Royal Air Force bombers took off from England. 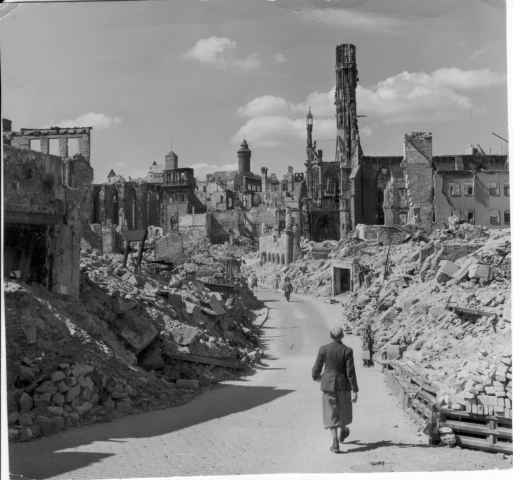 Their goal was to reach Nürnberg and bomb the living daylights out of the city. The night was clear but extremely dark because of the new moon. Even though there was a ‘Master Bomber’ flying over the target, trying to direct the other pilots, a few flew off course in the dark and crashed. From their bunker, the people in Lonnerstadt watched as a German Nachjäger, a fighter aircraft used especially at night, chased and shot down a RAF Helifax DK 269 from Squadron 76. The burning plane tumbled in the air, barely missing the church steeple in Lonnerstadt, before it finally crashed in the forest by Sichardtshof. All seven of the English soldiers, aged 20-23, were killed in the crash. A plaque still marks the spot where they died. This entry was posted in Nürnberg on October 23, 2011 by lauralibricz.